We work hard to keep our bees happy. We want to ensure that the honey they make gets to you in its purest and most natural RAW form in order to preserve its health benefits. Our honey is not heated, filtered, or otherwise messed with in any way! 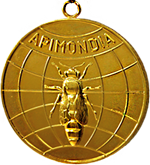 We are also proud to say that our honey is award-winning from Apimondia, or the International Federation of Beekeepers’ Association, where our hard working bees brought the U.S.A. the gold in granulated honey!